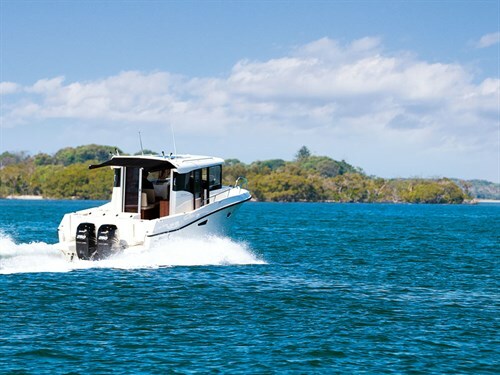 On the outboard-powered Arvor 905 Sportsfish, tradition meets contemporary practicality and modern technology. The Arvor 905 Sportsfish has a typical Arvor feel yet holds its own character. Its hull is defined by its broad shoulders, the maximum beam running well forward and combining with high, almost slab-like freeboard to create the volume that is true to Arvor DNA. She’ll hold her own in an offshore pelagic battle, become a warm and comfortable cruiser for an inshore exploration, provide cosy accommodation for an extended sojourn or maybe become the venue for an aquatic party when the whole gang gets together. I’m still getting my head around an Arvor boats with outboard motors instead of shaft-drive. Arvor recognize the efficiencies of modern outboard technology and their quiet, fuel efficient power. 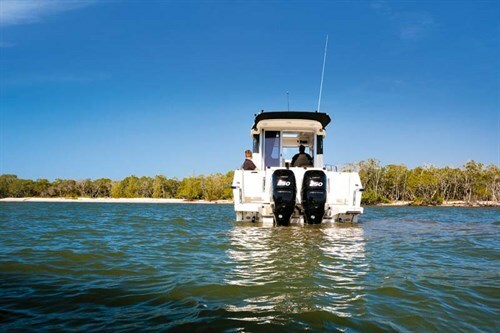 Our Arvor 905 Sportsfish had a pair of 250hp Mercury Verado outboard motors – hang on to your hats, there’s no substitute for horsepower on these 250hp outboard engines. The current trend toward the upright cabins reflects time-honoured trawler styling. A few years ago we looked at these traditional cabin styles and said "really?" Now we realize their practicality and find them visually appealing. There’s plenty of room inside this cabin accentuated by the big upright windows providing 360-degree vision. The side windows are lightly tinted, with a sliding section over the dinette combining with the large overhead skylight to provide both ventilation and natural daylight. Inside the cabin, we find an appealing control centre fronted by a comfortable helmsman’s chair on a shock absorbing pedestal. 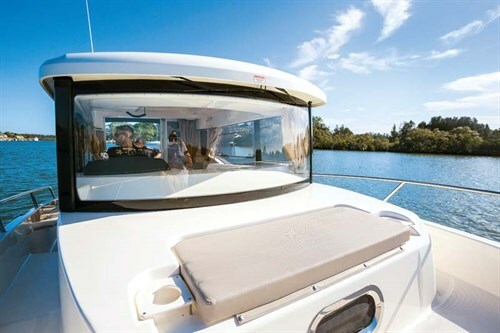 Overhead is a Simrad VHF, drop-lighting recessed into the fibreglass head-lining and a pair of stereo speakers. The dashboard is quite simple and well-assembled, incorporating twin-sync binnacle controls, Simrad electronics package, including Raymarine NSS 9in Evo 2 multi-function display, Vessel View 4 on-board management system, Lenco trim tab controls, Precision Auto Pilot, Quick winch control, Fusion marine entertainment system, full switch panels, Mercury digital/analogue gauges and the joystick toggle controls. There is plenty of dash space for top-mounting further electronics and it’s finished-off with a neat combination stainless steel sports steering wheel. 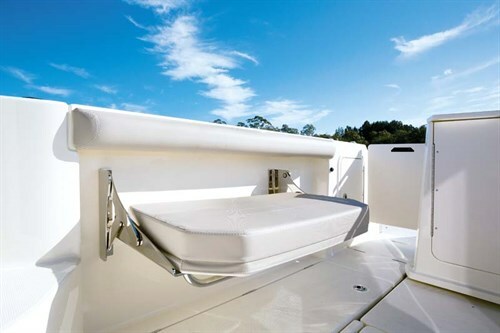 Arvor Boats have designed a nifty convertible dinette for the port side. The forward backrest has dual mounting points and the base slides on tracks so the unit can be used as a forward facing passenger seat or turned around for a proper dinette. It can also be converted into a smallish berth for added facility. 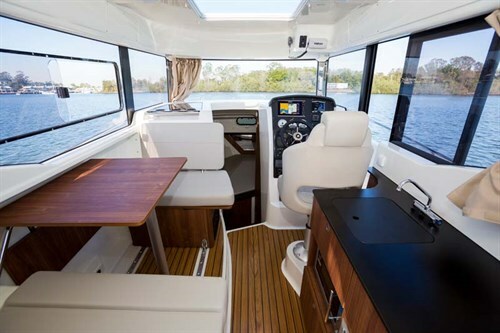 Opposite is a very neat galley complete with stainless sink with mixer, timber cabinetry, Australian-compliant microwave, Waeco compressor fridge, pantry and map drawers. A large open companionway leads down two stairs to the accommodation and head. Up front is a diagonally shaped berth, which I’d call a very cuddly twin. The master is a large double transverse bunk running east/west under the cockpit floor that looks really cosy and comfortable. There’s even a small dressing lounge on the way in as well as a switch panel with circuit breakers, drop lighting and more speakers. The starboard side has a compact bathroom/head with a pump out toilet and black water tank, vanity with cabinet and pull out shower head, a shelving unit and storage and all vented via a side porthole. There’s a drop down panel behind the head providing access behind the dashboard where you find a big array of wiring. While it is quite neat, I have to admit, I’ve seen neater. Overall, the cabin is well proportioned and will provide comfortable accommodation for overnighters, or even a few extended trips. Arvor offer optional air-conditioning and heating for even greater comfort. I simply love the side entry doorway that provides immediate access to the starboard walkway and it will certainly aid single handed boat control for those of us that love to go it alone. To the rear are glass-panelled, full-length lockable sliding doors with a light and airy, yet totally secure, feel. The 905 Arvor Sportsfish has a full walkway either side of the cabin with plenty of grips, handholds and a non-skid finish. On the bow you can take a seat on the recess on the cabin roof, a great place to get some wind in your hair. The bow is defined by a stainless steel split bow rail and anchor fitting out front. The Quick capstan-style winch and large anchor well is hidden under a pair of hatches, while there are foot controls on the foredeck for convenient mooring. On top of the cabin is a tonne of room for aerials and lights and it’s the perfect spot to carry water sports toys. To the rear we find four stainless rocket launchers, a canvass cockpit awning and yet another pair of speakers. We have grown to expect big, deep cockpits with Arvor and this one is no exception. It has fold down seats on both sides for passenger comfort, non-skid on all flooring areas and combing tops, seven stainless steel rod holders, twin kill tanks and a large cavity under the floor that houses the hot water system, fuel tank and the four batteries giving plenty of ship and engine power. At the rear we found a very comprehensive "fish station" featuring a sink, cutting board, cold water wash-down, knife holder, a large plumbed live bait tank, as well as a separate drawer refrigerator and storage. It slides fore and aft electronically to allow full-tilt on the engines and maximizing the deck room – very nifty! Arvor inform us that the refrigerator has now been replaced by twin fold-down seats, which is probably quite sensible. Either side of the fish station is a door for access to the rear bollards, stern platforms and drop down ladder. There are really handy access and storage hatches all around this boat, including the cockpit. 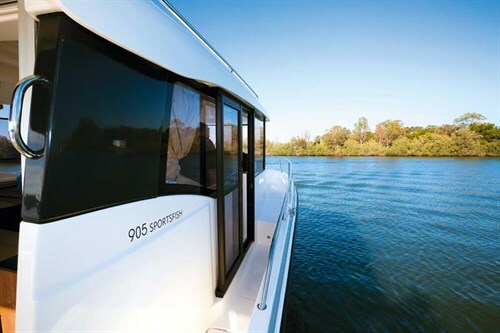 The Arvor 905 has a very good all-round hull with lots of volume forward, nice high sides giving a plump interior full of features. Hydro-dynamically this means she rides beautifully on the plane, but she will get a bit of slap and tickle when the chop rises on its sides. She keeps her head up high with a very proud attitude. Whilst it’s a rather high centre of balance she feels very stable with very little lean into corners due to the moderate deadrise and three-metre beam. 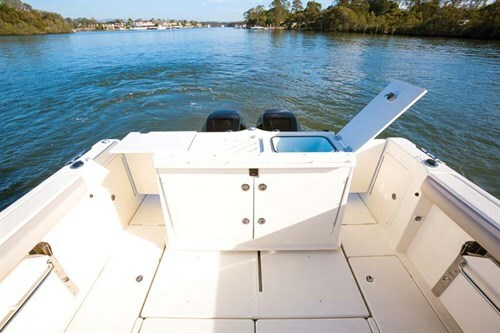 The ride is assisted where necessary by Lenco trim tabs, yet I found very little need for them due to the high amount of trim control from the twin outboards. That said they are certainly worth having when there is a large load of shifting weight when the party arrives, as well as assistance in big cross winds. It is essential to note that the Arvor 955 Sportsfish has achieved the international Category "B – offshore" classification to CE standards, carrying a load of 10 people. When I was a young ’un, I loved playing computer games with joysticks, I always wanted to try to out-manoeuvre and beat the game. Time and the need to grow up put a hold on that pastime; it’s now boating and fishing with a bit of work thrown in. 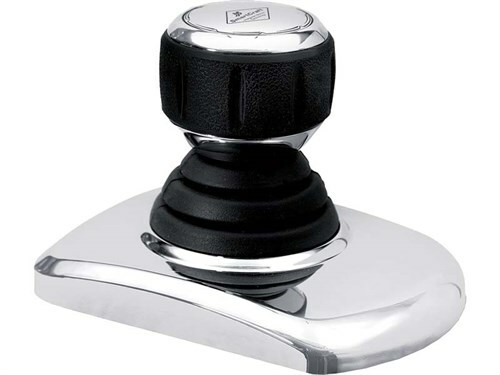 Thankfully, Mercury has come to my rescue, offering Joystick Piloting for multi-outboard and inboard engine vessels. 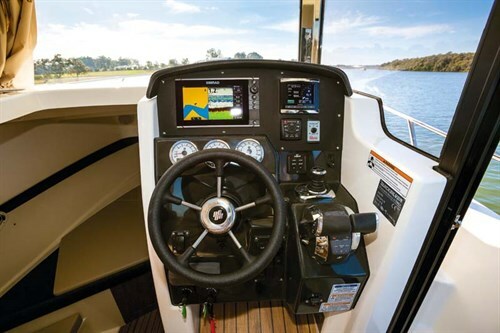 What was once the preserve of power boats, the system allows for easy 360-degree control of the vessel by simply engaging the system twisting the stick for throttle control and aiming it where you want to go. In testing we could easily move the 905 Sportsfish directly to port and starboard as well as quarter-on while maintaining the hulls bearing perfectly. It did this by independently controlling each of the Verado’s throttle and steering angle, even engaging reverse when needed. Impressive stuff, but for a seasoned operator, seeing the engines pointing in opposite directions caused a small heart-skip. Once we were comfortable with the system, it was a joy to use and entertaining for us and onlookers. We did find that taking control of the engines ourselves we could still rotate the boat faster than the Joystick however. The system also features Skyhook, a GPS-based digital anchor. Our boat was missing the needed GPS antenna, so the system was disabled, but it sounds like a cracker. With the precision of the Joystick Piloting, we expect it to be highly accurate and valuable when setting fenders, waiting for a spot at the fuel dock or when wanting to hold over a fishing mark. Impressively, the system uses an integrated compass to hold bearing too. Should you be out in less-than-ideal conditions, you could rotate the cabin of the boat to act as a wind shelter. Handy. Overall we all loved the Arvor 905 Sportsfish, yet there were three differing opinions on the preferred configuration from Editor Tim, Arvor’s own Peter Collins and I. Personally, I was very happy with the boat as displayed, but I would be happy to drop a little horsepower if budget were a problem. I also see no advantage to the rather expensive toggle controls due to the manoeuvrability of twin outboards. In fact I reckon that if you can’t drive a boat of this size with that configuration then perhaps you’d best take up golf. PEOPLE (night) 6 (day) 10 offshore "CE "B" rating"
See the full version of this review in Trade-A-Boat #482, on sale September 8, 2016. Why not subscribe today?